As I am typing this, I am sitting comfortably in my perfect blogger chair, the chair on the right in the photo above. 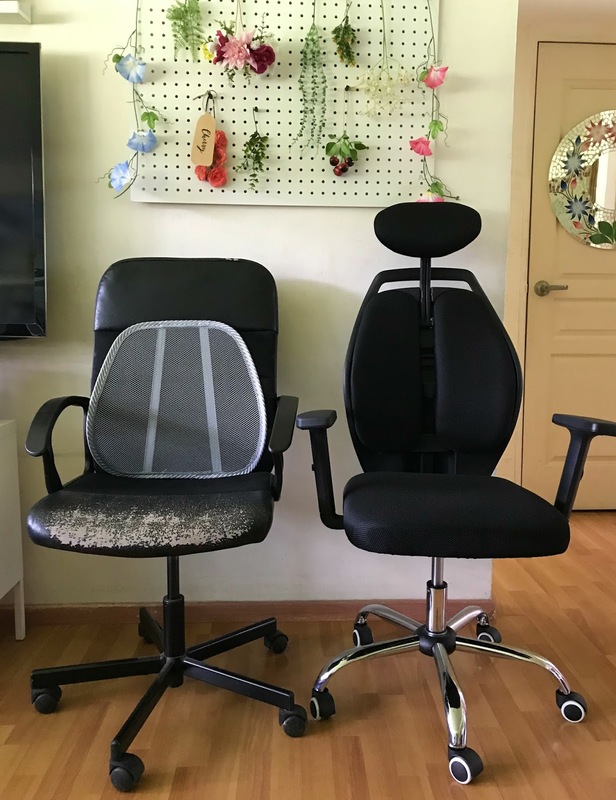 I purposely took a photo of it beside my hubby's old home office chair so you could clearly see the difference of an ergonomic chair from an ordinary office chair. I have been using the ErgoSpine™ Ergonomic Office Chair for a few weeks now and I can vouch it does make a big difference. 1) ErgoSpine™ Ergonomic Office Chair is designed for comfort and relief. One of the reasons why I have not been blogging about my family's adventures, travel and staycation experiences this year was because I frequently get backache from sitting in my ordinary office chair for prolonged period of time at my day job. Moonlighting as a blogger at night is no easy feat, even more so when you don't have a blogging chair that is spine-friendly. 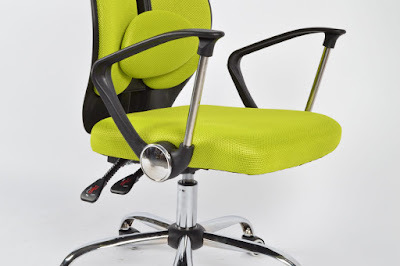 What makes ErgoSpine™ Ergonomic Office Chair spine-friendly? Its dual cushions support your back firmly without exerting pressure on your precious spine. It actually distributes the pressure to the left and right back muscles effectively, hence it helps you avoid low back pain and fatigue due to pressure exerted by the general chairs. If you noticed, my hubby and I had to use a back support when using our old ordinary office chair to prevent us from getting a backache when we moonlight at night as a blogger and an AutoCAD designer respectively. Using the ErgoSpine™ Ergonomic Office Chair saved us from the trouble of using additional back support because the chair itself already provides great comfort and relief. 2) ErgoSpine™ Ergonomic Office Chair is adjustable. 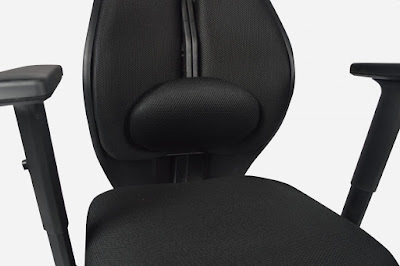 There are times when I had to recline my chair for a while to take a rest halfway from blogging and I love how the ErgoSpine™ Ergonomic Office Chair comes with a headrest that can be folded inwards and downwards to become a lumbar support. When installed properly, the lumbar support pad adjusts vertically to provide back support over a four-inch range, supporting the natural curve of your midback, or lumbar region. On top of this, the height of its armrest can be adjusted as well according to the user's comfort and preference. 3) ErgoSpine™ Ergonomic Office Chair is customizable. When you order your ErgoSpine™ Ergonomic Office Chair from Primero.SG, they will provide you many options from colour, material and choice of armrest. If the adjustable armrest isn't appealing to you, you may opt for a Chrome Armrest as featured above. You also have the option of getting a Glossy Black PU Leather instead of Mesh Fabric. I personally picked Mesh Fabric in black as I don't wish to get another leather chair that peels off after prolonged use. I love how the mesh fabric is breathable and apart from black, they also offer multiple colour options to suit your personal style. Primero partners with the most reputable factories in the world to produce its furniture. Its founders Jonah and Jordan who have been in the manufacturing industry for some time, had some friends who manage their own factories and the duo convinced them to micro-manufacture for Primero. The many benefits of micro-manufacturing include increased quality of products , customized furniture designs, fast production times, ability to procure spare parts instantly, lower cost of production and greater control over the details of each product. With all these benefits, Primero is able to produce extremely high quality and partially handcrafted items. 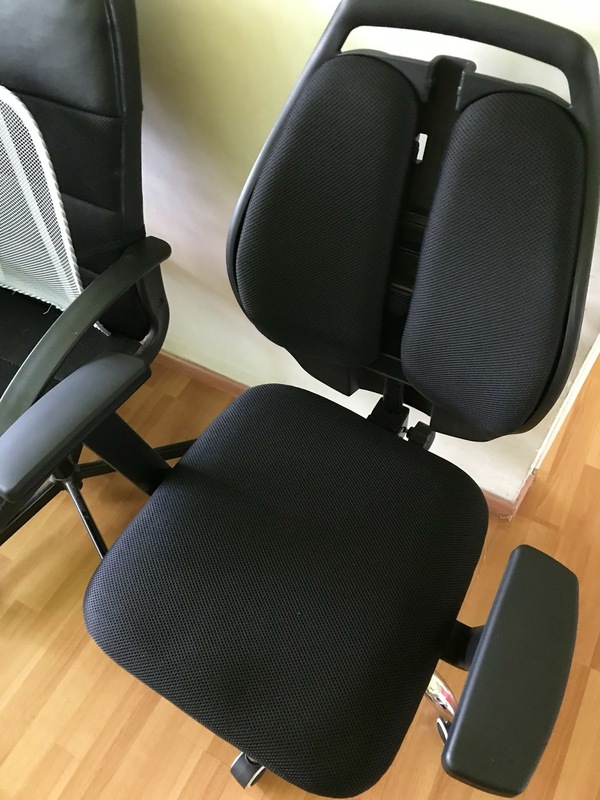 Disclaimer: Primero sent us an ErgoSpine™ Ergonomic Office Chair for the purpose of this review. All opinions stated above are based on our personal experience using the chair for almost a month now. Product details and some photos are extracted from the Primero website with permission.